Omaha hold’em, often called simply Omaha, is an exciting poker game that is strikingly similar to Texas hold’em, although it does have a number of differences to set it apart. 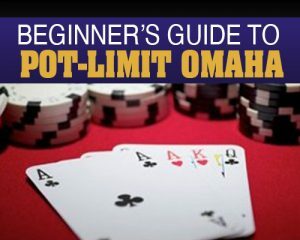 Pot-Limit Omaha is the second-most-common form of poker in the world today. Before the 2003 poker boom, Omaha was much more prevalent in American cardrooms, and was the most popular cash game in many rooms around Europe. Texas Hold’em has become the poker standard across the world, leaving Omaha the most popular alternate game. More players will consistently see the flop in Omaha. The gap between premium and marginal starting hands in Hold’em is not reflected in Omaha. Because PLO is a drawing game, suited and connected cards are more powerful than in Hold’em, making the coveted pocket aces not nearly as much of a powerhouse. With more players seeing flops, the average pre-flop pot size is typically much larger than in Hold’em. The bigger the pot going to the flop, the bigger the bets will be post-flop, making Omaha play much larger. You need a stronger hand to win at Omaha. The majority of Hold’em pots are won by a two pair or weaker hand. These types of hands do not hold up as often in Omaha, meaning there is a paramount need for made hands with redraws. Omaha is a more hand-driven game, affording you far fewer opportunities for bluffing. If there are three to a suit on board, you can almost always assume someone has the flush in Omaha, and a paired board yields a very high probability of someone holding a tight (full house), whereas that would only be a minor concern in most Hold’em hands. With the multiple combinations of draws being played in every hand, value betting properly becomes far more crucial in Omaha. If you are not able to fully exploit the situations where you have the most equity, you’re going to have a hard time beating the game consistently. Position is just as important in both forms of poker, but for different reasons. In Hold’em the player with the best position will win the pot the most often, while in Omaha success is more hand-driven. However, the player with position in Omaha is best situated to properly modulate and control pot sizes. Tight-passive players are less likely to be steamrolled in Omaha than in Hold’em. Reduced opportunity for bluffing reduces how effectively you can bully a passive player. It’s not impossible; it’s just far more difficult. Most basic rules of PLO are similar to those of Texas Hold’em. Before every hand, two players have to post the blinds and there is a flop, a turn and a river, just as in Texas Hold’em. However, the only difference between the two is a significant one: As mentioned earlier, in PLO you are dealt four hole cards instead of just two. On top of that, you always have to use two hole cards and three community cards to make your hand at the showdown. Unlike in Texas Hold’em, you can’t simply choose the best 5 of the 7 cards. That’s why the worst starting hands in Omaha are quads in your hole cards. You can only use two of these cards, but have no chance of improving your hand. Another aspect that is special about PLO is of course the bet size: It is not unlimited as in No Limit, but there is no specified limit as in Fixed Limit either. The maximum raise always depends on the current pot size. As a rule of thumb you can keep in mind that a pot size raise equals the current pot + three times your opponent’s bet. If there are $25 in the pot and your opponent bets $25, you can raise to a maximum pot size of 25 + 3×25 (75) = $100. If you’re unfamiliar with Pot-Limit, there are a few key differences in how it plays compared to a No-Limit game. Before we explain the differences, you need to know how Pot-Limit actually works. Remember, if you don’t announce “Pot” first, you’ll be called on a string bet if you put the $68 in first, then try to add a raise amount. Always vocalize your intended action. If you don’t want to figure it out yourself, asking the dealer what pot (or your maximum bet) is is also an easy way to go. Be patient with your starting hand selection.Don’t fall into the trap of thinking that anyfour cards are worth playing. A bare pair of aces isn’t as good as in hold’em.Two aces can help form a strong preflop hand in PLO poker, but unless they improve on the flop you’re unlikely to win the pot, especially in a multi-way contested pot. There is less bluffing in PLO poker.While bluffing does occur, it’s less prevalent in most players’ PLO strategy than happens in hold’em; a show of strength in PLO is likely to be a strong hand. Draw to the nuts.Although there are times when you can play a weaker draw aggressively, drawing to the nuts is the best idea. Stop thinking like a hold’em player.Many PLO players come from a no-limit hold’em background and play the game as such. They’ll overvalue one-pair and two-pair hands, as well as open-ended straight draws (with eight outs). The latter is particularly problematic, since in PLO it is possible to have “wrap” draws with up to 20 outs with the perfect hole card and community card combination!